Model 525S has a well-balanced range of stitches & features and is perfect for beginners and those who are more experienced. It handles all types of fabric well and offers affordable power and precision. 24 Built-in stitch choices. Variable stitch width & length. Jam proof drop in bobbin system. Freearm for circular sewing. Adjustable foot pressure. Auto 1-step buttonhole. Built-in needle threader. Drop feed for freehand embroidery. Convenient thread cutter. Quick foot conversion. The jam proof drop in bobbin system ensures smooth trouble-free stitching. 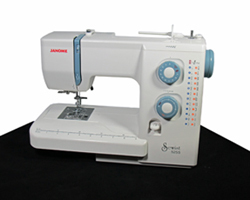 This model has a range of stitches and features to cope with general sewing tasks. Stitch selection is by dial, just choose the letter which matches the stitch and start sewing. The automatic 1-step buttonhole produces perfect buttonholes in one easy step while the automatic needle threader takes the strain out of threading the needle.